A lot of work goes in to making honey. 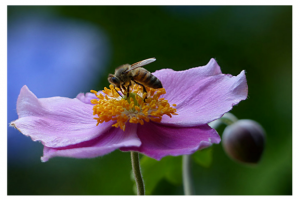 Honeybees have to visit over 2 million flowers to make a pound of honey! A bee will visit between 50-100 flowers during one trip. Entrepreneurs work hard, have passion to achieve their creative goals! The honey bee is the only insect that produces food eaten by man. The natural fruit sugars in honey – fructose and glucose – are quickly digested by the body. This is why sportsmen and athletes use honey to give them a natural energy boost. Honey has other beneficial properties which are used by different industries. Entrepreneurs are creatives they create wealth and jobs and are the lifeblood of our economy. Bees fly at an average speed of 20mph. Entrepreneurs have to be responsive and respond quickly to change. Entrepreneurs have the capacity to learn new areas related to their business in a relatively short period of time and translate complex in to more simple bite size information. The bees’ buzz is the sound made by their wings which beat 11,400 times per minute. Bees buzz as they don’t sleep. Entrepreneurs buzz during their working day and are often night owls. One of the most interesting and wonderful things about honeybees is just how sociable they are. Bee colonies (at their largest) can grow to 40,000 members in the busy season. Imagine living with 40,000 other people in a small living space. You’d quickly have to learn how to get along! Honeybees have a variety of ways in which they make friends with each other. For example, they split up the work they do to keep their nest running smoothly. Some look for nectar, some take care of the hive and others make sure the brood (the honey bee eggs) are safe. Everyone has a clear job, which is what makes the hive so very efficient. Honey bees communicate with one another by dancing. Entrepreneurship requires good communication, team building and leadership skills. Every time a bee lands on a flower, a little bit of pollen sticks to their feet. Some pollen also falls off as they fly about. When this pollen falls onto other plants, pollination occurs, which means the plants reproduce. Bees pollinate two thirds of the world’s crops and flowers. They make two thirds of all our plants grow, giving us food to eat and lovely flowers to enjoy. We have a lot to thank bees for, which is why we must protect our precious bees. Entrepreneurship creates the lifeblood of our economy without which the rate of evolution in society would no doubt reduce considerably. The “busy bee” has inspired me to take action and launch Rainbow Brands. We focus on selling products that promote healthy lifestyles to help alleviate the stress in our environment. Do keep following and help us spread the word about this fascinating insect!